It’s always in the simplest, purest of ingredients that you notice the biggest difference. This time, I’m shining the light on a local farm that treats their hens right. And of course, happy hens => happy eggs => happy eating. What’s even better? I don’t even have to stand in line at the farmer’s market to get them. They have a drive-through right at the farm, and literally all you need to do is “honk for service”. Yup, an egg drive-through. Where do I even come from, right? Maple Ridge, British Columbia. And the adorable farm is called “Never Say Die” Nursery. See? Adorable. But back to the eggs, gorgeous doesn’t describe them. And the term #yolkporn disgusts me. Seriously, don’t adulterate something so natural and nourishing. Whenever I come across a good egg it always makes me momentarily breathless. It must be the combination of the yolk’s bright tangerine color (#f28500 hex color code, look it up), the way the yolk stands so proudly in a visibly distinct sac of albumen when you crack it open that inspires me to treat it well. This time, it’s poaching. 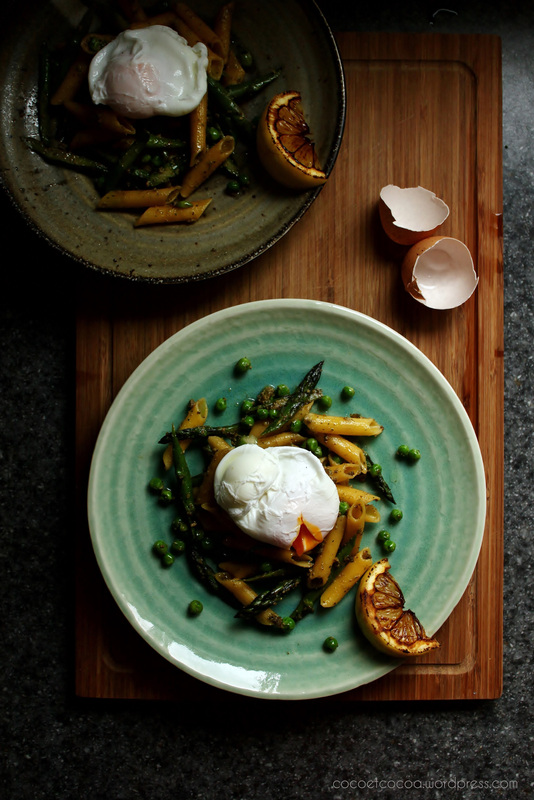 There’s something about the tenderness of spring asparagus, the whimsy of sweet peas, and the viridity of a jiggly poached egg that makes them, together, instinctively irresistible. As for those limp, watery eggs that have a sad, deflated, pale yellow yolk swimming inside of them, hide them in a box-mix cake or something. Do not attempt to serve them in their form. Also, never buy them again, for those eggs are from caged, drugged hens (in the name of mass economical production! oh joy!) and should not even be produced. Hopefully you’ve seen the light as far as the topic of eggs, now go and convince your taste buds! Believe it or not, this is my very first time poaching an egg. So as you can see, it really is nothing to be scared of. To be honest, I was pretty terrified right up to the point I lowered in the egg, but immediately I realized that you are physically incapable of messing this up so long as you follow along this little tutorial. Also, as if I have not drilled it into your kitchen backsplash, a good free range egg is not negotiable – you and your family deserve at least that. Step 2: Add 2 tbsp white vinegar to a large pot of water and let it come up to a rolling boil. Step 3: Turn off the heat and use a spoon to stir the water quickly in a clock-wise direction to make a whirlpool in the pot’s center. Step 4: While the current is still strong, gently tip the egg into the middle of the whirlpool. Step 5: Cover and let it poach for 150 seconds (2 1/2 minutes), then carefully lift it out with a slotted spoon. At this point you can either serve it immediately, or place it in a bowl of cold water to stop the cooking process. To make the asparagus penne, cook the pasta as directed on the package. Keep the pan on medium heat, add 1 tbsp of the oil just to coat the bottom and add the asparagus. Season generously and let it sit undisturbed for 20 seconds or so to get some browned, crispy bits. Stir a couple times, just until all the pieces are bright green. Transfer the asparagus into a large salad/mixing bowl. Stir in the frozen peas to stop the cooking process. By now the pasta should be cooked. Drain and toss it with the vegetables. Keep the element on and add the remaining oil to the pan and stir in the pesto to wake up its flavour. Deglaze with the white wine and stir until the alcohol burns off. Pour the sauce over the pasta mixture and stir through. Check and adjust the seasoning. Divide between four plates. Drizzle with extra virgin olive oil, top with an optional (but definitely recommended) poached egg, and serve with a slice of caramelized lemon. To make a vegan pesto, throw 50 g sweet basil, 2 garlic cloves, 3 tbsp toasted pine nuts, 3/4 tsp sea salt, and 1/2 cup olive oil in a small food processor and whiz to a textured puree. Store in a glass jar, pour a thin film of olive oil over top to seal and cover with the lid. This will keep in the fridge for about 2 weeks.